If you do a lot of sewing, you'll soon find yourself with small offcuts - little scraps of fabric that multiply at an alarming rate. There was a time when I used to throw the small pieces away. Not anymore!!! Anything larger than 2" x 2" is kept and stored for future use. Lots of little pieces of fabric can soon turn into a mess, and you can never find the required colours and patterns when needed. 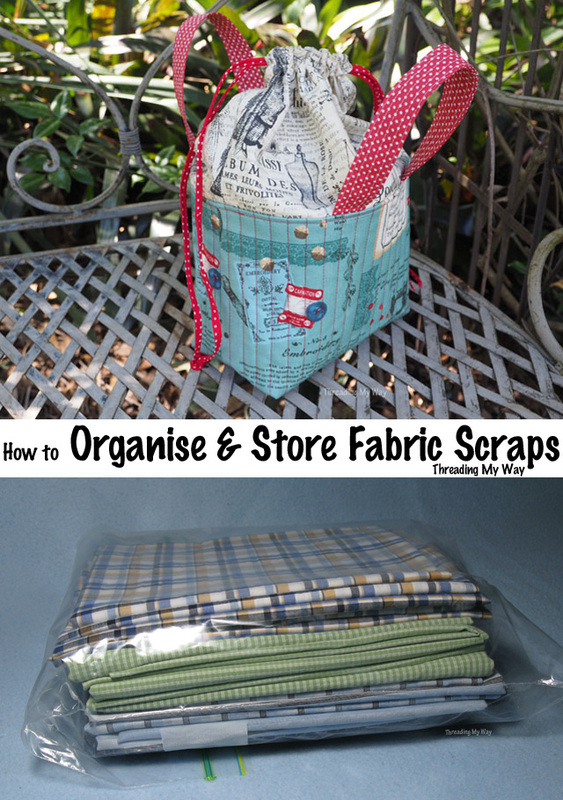 That's where today's post comes in - creative ideas to help you organise and store your fabric scraps. Grab some of your scraps and whip up several zippered pouches - keeping to one colour way for each fabric scrap bag. Daryl, from Patchouli Moon Studio, has done just that, and has a whole family of bags of differing sizes. I also sort and store my fabric scraps by colour, but I tend to let them accumulate first. As I work on a project, the fabric scraps are thrown into this little drawstring basket, which I originally made as a sewing basket to take to quilting retreats. For the rest of the year it sits on my sewing desk holding offcuts. When I'm in the mood, or when the basket is full, I sort the scraps by colour and transfer to zip lock plastic bags stored in a large IKEA cube. How about some metal buckets to collect fabric scraps as you cut. 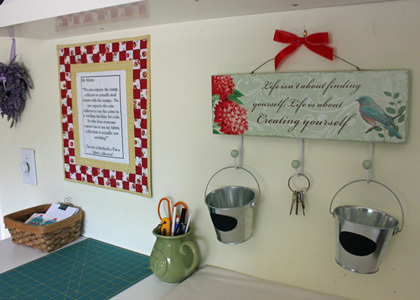 Julie, from The Crafty Quilter, has two metal buckets hanging from an inspirational sign. Pretty and functional at the same time. 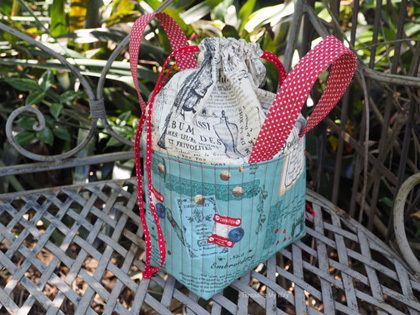 Another idea from Daryl, over at Patchouli Moon Studio - Scrappy Fabric Baskets. These were designed as thread catchers, but I think they'd work well for sorting scrap fabric by colour. Chris, from made by ChrissieD, uses a bucket system for organisation while sewing. Once a project is finished, everything then gets put in its allocated place. 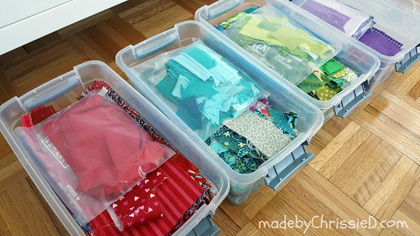 Fabric scraps are sorted into colours and stored in plastic tubs. Sewing with a wide variety of fabric types can make storing fabric scraps even more complicated. Stephanie, from Swoodson Says, uses up every last scrap of fabric, so organisation is the key. She has a system for storing different fabric types and sizes, right down to a tub that houses fabric to be shredded. One thing I haven't touched on, is what to do with fabric scraps BEFORE storing them. There's a few ideas in some of the links below. 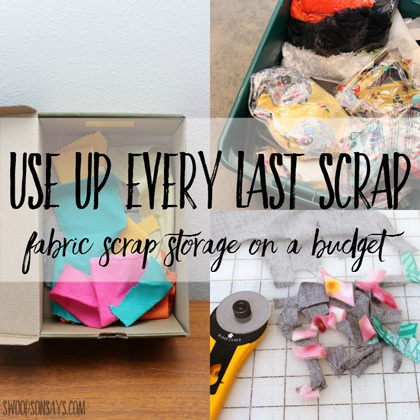 How little is too little when it comes to keeping fabric scraps? Tell me how you manage to keep on top of scraps. 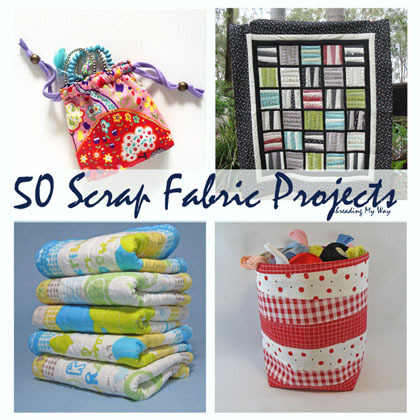 Now that your scrap fabric stash is organised, here's a few projects that are all made with small pieces of fabric. I am with you Pam I toss my scraps in to a bag next to the machine and sort them later by colour in to Ziploc bags. It makes life much easier when I need to find small pieces of fabric in a specific colour for a paper piecing project. I really need to get my scraps sorted, they are just in a big old plastic box at the moment. I like the idea of colour sorting them. Guess what I'll be trying to do this weekend? !